Cliff climbing, underground rivers and public transport passing for art. What’s the first thing that comes to mind when you think of the Philippines? Call centres, super busy roads, and mega cities? What about: lush tropical rainforest, weird and wonderful food, caving adventures, endless beaches (a beach surrounding an island is endless, right?) world-class snorkelling and diving or a cool trifecta of Filipino, Spanish and American culture? Sadly, the Philippines is underrated by the vast majority of Aussie travellers, probably because all its excellent draw-cards are not widely known. Cambodia, Thailand, Bali and Vietnam (to name only a few) have become the stalwarts of Southeast Asian travel. But it’s time for something new. As a less popular holiday destination, the Philippines has fewer tourists to contend with and because of this, more places to feel “out there”. Filipinos are much more accustomed to domestic and Asian travellers compared to young westerners. Regardless, they are incredibly welcoming. It’s hugely economical for the Aussie flashpacker. Getting there, staying there and eating there – all are very affordable, leaving those extra pesos for adventures and splurges. The archipelago nation is made up of 7107 islands – each unique – so everyone can find something they like. Here are a few ideas to whet your whistle. For such a teeny, tiny island (the third smallest province in the country), Siquijor has an overwhelming amount of activities to keep you entertained. Cliff-jump into water so clear you can see the coral seabed at Salagdoon Beach (less lethal than it sounds). 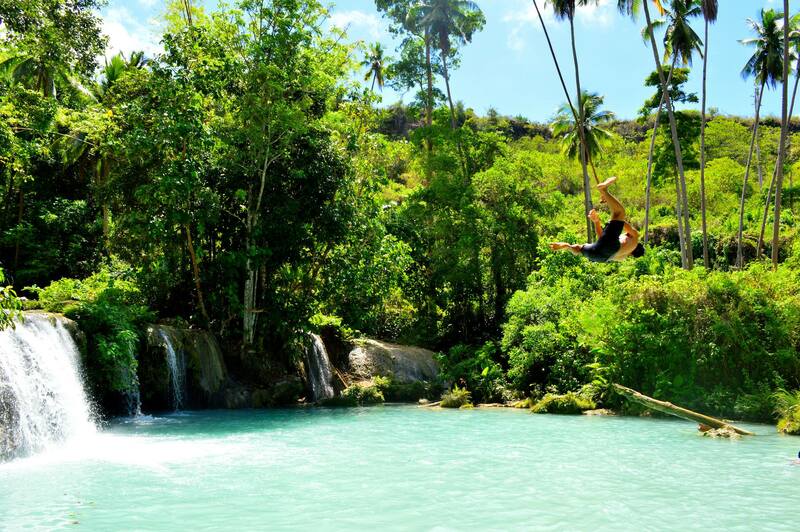 Swim in the turquoise waters of Cambugay Falls (or rope swing into them). Get your spelunk on, deep in the heart of the island within Cantabon Cave (only one torch is supplied, so all you light-lovers BYO). Snorkel at any one of the stunning beaches (maybe you’ll find Nemo or Dory). Spend an evening firefly gazing (you’ll see why the Spanish named this place “Island of Fire”). The best way to jam everything into a couple of days is to hire a scooter and self-drive the island, road trip style. It’s not really as bad as it sounds…a hard-boiled, fertilised, foetus-filled duck egg – OK, maybe it is. Regardless, this protein-rich Filipino street food is bound to get you in the spirit. A good way to ease yourself into trying this Frankenstein finger-food is with the tasty adobo sauce (thick soy). You will find these little pockets of pleasant at roadside stalls (and if you are lucky they will be chilled). Recently CNN compared the divisive treat to Vegemite, guessing the earlier in life you try it, the higher the chance you’ll like it. You be the judge. Towering above the seaside village of El Nido stands a crowd of limestone cliffs begging to be summited. Not only is the battle to the top adrenalin-pumping and a fierce workout, but it’s worth every bump and graze for the vista. There really is no better way to get an eagle-eye view of the adventure hub below and South China Sea beyond, where surrounding islands bob like corks adrift. No ropes or harnesses are used in the climb – it’s Bear Grylls all the way. And remember, what goes up must come down. How many people fit in a Jeepney? “One more,” goes the Filipino saying. But it’s not just people being crammed into these converted wartime troop-carriers. You may find yourself straddling huge sacks of pig feed or cradling a box of gabbling hens. When it comes time to pay, your fare is passed from one passenger to another until it reaches the driver. He sends back your change the same way, taken from the wads of notes wrapped around his knuckles. Jeepneys have just as much character on the outside as on the inside – every one has a custom paint job. Some of the murals are hilarious, some are inspiring and some frankly don’t make sense. Listed as one of the New Seven Natural Wonders of the world, this river is a must-see. Canoe tours head 4.3 kilometres upriver (head-torches provided this time) giving you a chance to meet the local bats and appreciate the ancient formations, including a gargantuan 300 metre cavern (keep your mouth closed as you look up). For those nature-lovers, the 5.2 kilometre Monkey Trail from Sabang to the river mouth will impress. Warding off the sticky-fingered simian locals, dodging snake-sized centipedes that fall from the canopy and ziplining hundreds of meters across the hungry ocean make this route somewhere Indiana Jones would feel at home. Like a scene from the set of The Beach, this lagoon would impress even Leo (not surprisingly Survivor Philippines was held a few hundred meters away). The walled lagoon is not only expansive (as suggested in the name), but a perfect Photoshop blue with Lake Placid calmness (but no monster crocodile). The still water lends itself to kayaking – guided tours run daily – which is the best way to explore the lagoon. For a sub sea-level look, you can slip into the water for snorkelling. Rumour has it there are some massive friendly fish in these parts. If by some miracle Big Lagoon has left you wanting more at the end of your paddle, you are in luck. Little Lagoon is right next-door, and just as magnificent. Cliff-climbing, swimming, hiking and cave exploration is all thirsty work in the tropical heat, which is where the delicious national rum comes in. What could be more fitting to enjoy on a tropical island than spiced rum (or rhum as they spell it). It’s the type of beverage that needs no frilly decorative umbrella or fancy fruit accompaniment. With the actual rum costing less than half the mixer in this part of the world, you won’t have to worry about the wallet sting. Tanduay is certainly the drink to cheers to a good holiday.